Under-fire Intel has been surpassed by Samsung as the world’s largest semiconductor manufacturer, according to a report published by Gartner last Thursday. The US tech company had been the leading semiconductor market since 1992, but was overtaken by its South Korean rival during Q2 2017, when Intel brought in revenues of $14.76 billion. In the same period, Samsung generated $15.8 billion in chip sales buoyed by the soaring demand for NAND Flash chips. Even as Samsung and Intel swapped positions on the leaderboard, the overall semiconductor market grew by high double digits last year. According to Gartner, the increasing popularity of IoT devices, wearables and mobile handsets helped the sector grow by 22 percent last year to $419.7 billion worldwide. Samsung was the biggest beneficiary of the rapidly-growing smart devices market, increasing its revenues by a whopping 52.6% and raking in a whopping $61.2 billion. According to Gartner, the company accounted for 14.6% share of the global market last year. Intel, on the other hand, was only able to grow its market by 6.7, bringing in $57.7 billion and garnering a market share of 13.8%. 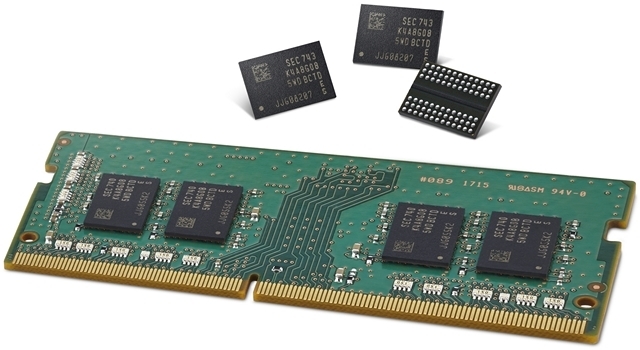 While NAND Flash prices went up 17% last year, DRAM prices rose 44%. Another main reason for Samsung’s rise to the top is the booming market for memory chips. According to Gartner analyst Andrew Norwood, “Memory accounted for more than two-thirds of all semiconductor revenue growth in 2017, and became the largest semiconductor category”. While logic chips remain the bread and butter for Intel, Samsung has a thriving memory chip business that got a huge boost last year following massive demand that raised NAND flash prices year-on-year for the first time ever.